When your power supply depends on the weather … life’s a lottery. Electricity used to be taken for granted in Australia, like running water. Not anymore. Thanks to chaotically delivered wind and solar, having power during hot weather is now treated more like winning the lottery. Joni Mitchell sang about not knowing what you’ve got till it’s gone in her ditty, Big Yellow Taxi. Likewise, Victorians have joined wind ‘powered’ South Australians in their appreciation of knowing what it’s like to swelter in the dark, whenever the sun sets and/or calm weather sets in. 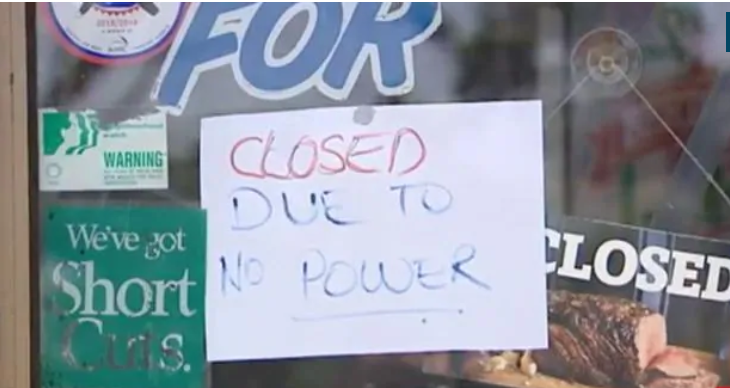 200,000 Victorian businesses and households were left fuming after a dramatic wind power output collapse during hot weather. This is happening in a state determined to destroy its coal-fired electricity supply (Labor MPs wept with joy when Hazlewood, a 1,600 MW plant closed) and throw all caution to the wind and sun. Victoria, just like SA, has set its very own suicidal 50% RET. South Australia’s obsession with wind and solar has left it with the highest power prices, in the world. Victoria’s Labor government is evidently keen to follow suit. For Victorians this means watching retail power prices rocket to equal or overtake SA’s. It also means more load shedding and mass blackouts. Sales of portable generators in Victoria will soon match those in SA. But, with every crisis comes an opportunity. Here, there’s a chance, a slim chance, of using Victorian’s anger at being left powerless during a heatwave to redirect energy policy towards reliable and affordable power, available 24/7. With neither major party gifted with the political temerity to actively support nuclear power, that means investing in modern High Efficiency Low Emissions coal-fired power plants. That’s the theme being promoted by the Federal Energy Minister, Angus Taylor. And for good reason. 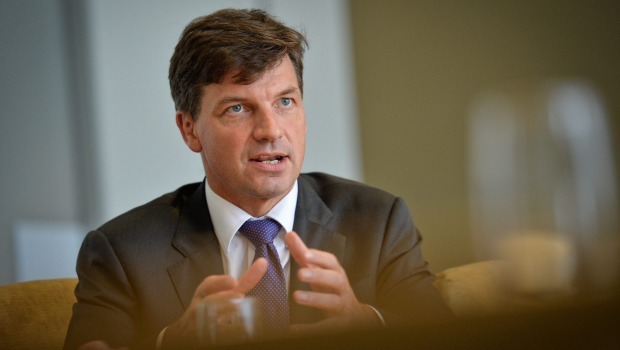 Energy Minister Angus Taylor has accused the Andrews government of “deliberately trashing” the reliability of the Victorian electricity grid by encouraging investment in variable renewable generation without backup and storage. The comments came after Victorian Premier Daniel Andrews talked up the “reliability” of renewable energy in his first public comments since Friday’s meltdown, despite solar and wind power combined providing just 14.3 per cent of the state’s power at the height of the crisis. Mr Taylor said a policy of investment in renewables without backup generation was “always going to end badly … (Mr ­Andrews) doesn’t understand that variable power is not necessarily there when the wind doesn’t blow and the sun doesn’t shine. Extreme heat and the failure of three coal-fired power units with a combined 1800 megawatt capacity prompted the market operator to order load-shedding black­outs to prevent the grid from shutting down at 12pm on Friday, cutting power to more than 200,000 Victorian households and businesses in rolling outages. An hour later, 1236MW, or 14.3 per cent of Victoria’s power, was coming from wind and solar generators, compared with 3105MW (36 per cent) from brown coal, 2129MW (24.7 per cent) from gas and 2151MW (25 per cent) from hydro, according to Australian Energy Market Operator figures analysed by NEMWatch for Renew Economy. Meanwhile, in South Australia, 67.8 per cent of the state’s energy was being generated by gas, with a small amount (82MW) coming from back-up diesel generators. Victoria was getting energy from South Australia at the time, as the cool change had swept across SA but not hit Melbourne. Mr Andrews said he would have “more to say” about further investment and reform to shore-up Victoria’s power supply for the summers ahead, but made it clear renewable energy was his priority. Victoria has a renewable energy target of 50 per cent by 2030. 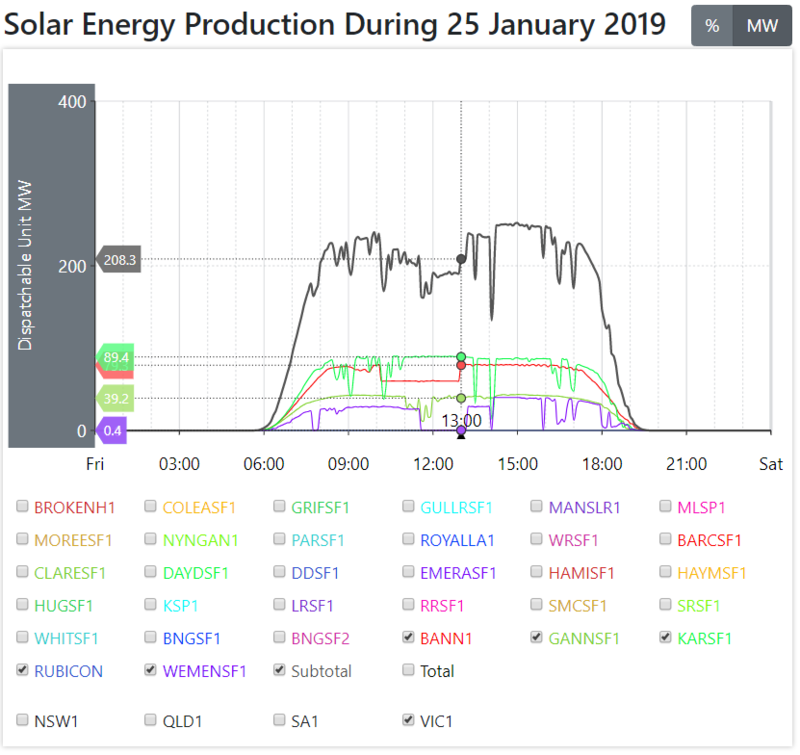 Rachel Baxendale reckons that at around 1pm on Friday, 25 January 2019 Victoria was getting 1,236 MW from wind and solar. 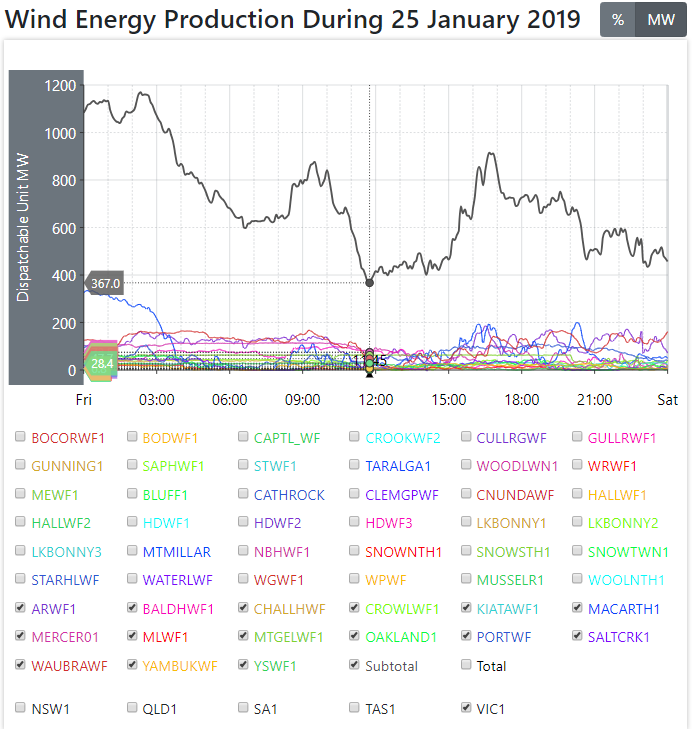 Maybe it was being piped in from outer space, because the actual production figures of wind and solar between noon and 3pm on 25 January in Victoria were a fraction of that. The data above courtesy of Aneroid Energy. Victoria has a total wind power capacity of 1,740 MW. For a brief while (in the early hours of the morning when demand was low) Victoria’s wind power fleet was producing almost 1,200 MW, which is around 69% of notional capacity. Rachel runs the well-flogged meme that there was a ‘failure’ of coal-fired plants to deliver, but doesn’t consider Victorian wind power’s “failure” to deliver the missing 31% of Victoria’s total wind power capacity during that impasse. Skipping over that failure, Rachel doesn’t seem all that connected with what actually happened during the critical hours of noon to 3pm (by 2.30pm, 200,000 Victorian homes and businesses were powerless). At noon, wind power output had collapsed from 1,200 MW to 367 MW. Not much focus in Rachel’s ‘analysis’ about the disappearance of 833 MW of wind power leading up to the critical juncture. Between noon and 3pm, Victoria’s wind power output ranged from 367 MW (ie 20% of notional capacity) and 460 MW (ie 26% of notional capacity). As to solar, the picture wasn’t much brighter. Victoria’s 370 MW of commercial solar, was producing a little over 200 MW around 1pm, or 54% of capacity. Suddenly, around 2pm, solar output dropped to around 130 MW, or 35% of capacity. The total commercial wind and solar output during the critical time ranged between 400 and 600 MW, with solar bottoming out suddenly to 130 MW and wind dropping from over 1,200 MW to 376 MW over the space of a few hours. As to domestic solar – unless the house is wired up to be “off-grid” – rooftop panels cease producing power during blackouts and load shedding events; in its usual installation configuration, domestic solar critically depends upon power from the grid. So the 200,000 powerless homes and businesses would have been adding nothing if equipped with solar panels. Rachel, the numbers that matter are all available at Aneroid Energy. As the Federal Energy Minister, Angus Taylor has the unenviable task of herding several state Premiers still currently obsessed with wind and solar – including the deranged and delusional Daniel Andrews and his hapless sidekick, Lily D’Ambrosio. Where that pair continue to waffle about Victoria’s inevitable ‘transition’ to nature’s wonder fuels, at least Angus Taylor is attempting to address the unfolding disaster – with a move to back reliable and affordable coal-fired power – the stuff that works 24/7, whatever the weather. The government will consider 10 new power generation projects that include coal under a contentious plan to help restore stability to Australia’s electricity system, after energy was cut to 200,000 homes in Victoria last week. Nearly 70 investors have seized the chance to compete for federal government backing to develop “firm” power generation projects — including at least two “clean” coal plants — aimed at reducing power bills and shoring up reliability. The Morrison government has received 66 submissions, raising fears in Greens and Labor ranks that the Coalition could finalise contracts for a new high efficiency, low emissions (HELE) coal plant before the election. The Australian understands there are 10 proposals entirely geared around coal-fired genera­tion or which include coal as a key part of their energy mix. In total, all 66 projects would represent an additional 29,000 megawatts of power generation. Energy Minister Angus Taylor yesterday told The Australian the government would move quickly to try and sign-off on projects if they stacked up. While the government’s underwriting program is technol­ogy neutral — meaning it is open to all solutions — Mr Taylor confirmed yesterday that the proposed power generation projects covered a range of fuel sources “including coal, gas and hydro”. “Early analysis indicates that the strongest interest was in gas, with projects and sites identified in Queensland, Victoria, NSW and South Australia. Pumped hydro sites were identified across the ­National Electricity Market and a range of coal projects have been proposed in our largest states,” Mr Taylor writes in The Australian online today. The Australian revealed last month that power baron Trevor St Baker had filed a submission for a $6 billion China-backed plan under the scheme to help develop Australia’s first HELE coal plants in Victoria and NSW. Submissions for the underwriting scheme closed last week, ­before 200,000 households in Victoria had their power cut in searing heatwave conditions. The outage cost Victoria and South Australia a combined $1.1bn in less than 48 hours, with the extrem­e weather conditions delivering windfall gains to energy gener­ators. Mr Taylor has argued that the plan to underwrite new investment and supply in the system showed the government was responding to the crisis. He said last week’s power outages would not have ­occurred if the Hazelwood coal-fired power plant in the Latrob­e Valley had stayed open. “The federal Liberal-National government will not stand by idly as Labor/Green state governments trash their electricity markets,” he writes today. “The Victorian Labor government and its activist backers have used the electricity network as a political plaything. The Australian has been told that the 66 submissions included 26 potential energy projects in NSW, 17 in Victoria, 15 in South Australia, 12 in Queensland and three each for Tasmania and Western Australia. A further three proposals were considered to be in early development. The Greens are pushing to ban taxpayer support for coal-fired power and plan to move an amendment to the government’s “big stick” legislation when parliament resumes later this month. The amendment — if successful — would prevent the government from using public funds to underwrite new “cleaner” coal plants. Mr Taylor argues that the governm­ent is trying to shift the “focus of our electricity sector back to ­reliability and affordability”, defendi­ng the underwriting program as an attempt to “address past failures by encouraging a more balance­d and competitive power generation sector”. “We will always encourage a commercially driven shift to renewa­bles — but it can no longer be at the expense of affordability and reliability,’’ he says. HELEs: the perfect immunisation against blackouts. Here’s Angus Taylor’s antidote for chaos. Late last week, 200,000 Victorian households lost power. This occurred after the partial closure of the Portland aluminium smelter in a desperate bid to keep the lights on. The prices paid by retailers for wholesale power during these hours were exorbitant and punitive. The Federal Liberal National Government will not stand by idly as Labor/Green state governments trash their electricity markets. We are taking control by underwriting new investment and supply in the system, and holding retailers to account to provide reliable, 24/7, affordable power. For many years now, the Victorian Labor Government and its activist backers have used the electricity network as a political plaything. 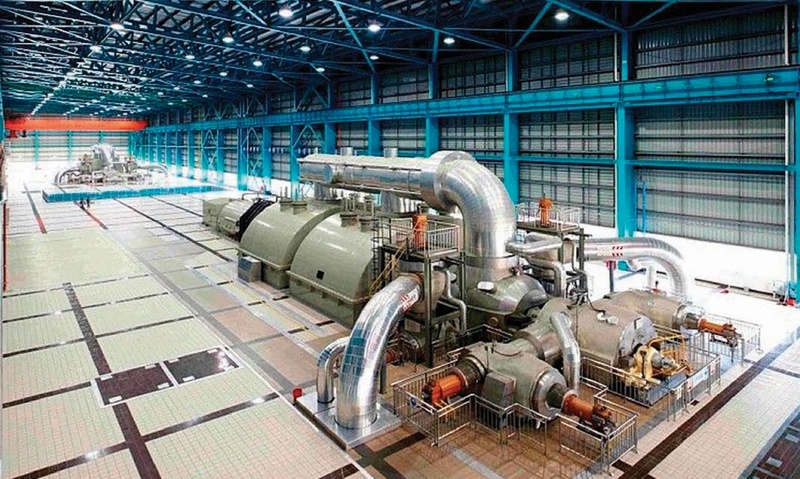 They’ve backed aggressive emission reduction targets and encouraged closure of baseload coal generation without giving any thought to reliable backup that will keep on the lights (and air conditioners!). The typical response of Labor/Greens to blackouts (or ‘load shedding’ as they describe it) is to find some way to blame coal. Activists blame coal for most of the ills of the world, which is why they have pushed for closure of all coal-fired power. Yet they well know that if the Hazelwood coal fired power station was still open, this disaster in Victoria would not have happened. The signals sent by state Labor governments through reckless emissions targets, together with the falling costs of variable renewable energy (especially solar) have distorted all focus away from reliability. Investment in variable renewable power generation is now unprecedented. Over $15 billion worth is committed in the short term, increasing solar and wind in the system by 250% in the next three years or so. It’s true that the Federal Renewable Energy Target played a role in this. But that program has now largely played out. The RET has more than achieved its goals and it is not driving new investment. Going forward, we cannot expect pensioners, workers and small businesses to subsidise the wealthy via their electricity bills. Renewables can now stand on their own. However, hospitals, schools, airports and factories — and all of us — need electricity when the sun doesn’t shine and the wind doesn’t blow. The state and territory Labor/Green governments ignore this fact, pretending there’s no problem. We’ve seen that a few expensive batteries won’t cut it when the grid is under real pressure. Victoria is now following in the footsteps of the South Australian Labor governments, which have delivered the most expensive and least reliable power in Australia, and close to the most expensive in the world. Queensland Labor is going down the same path, while the ACT Labor/Green Government has decided to target zero emissions, expecting that when things get tough they will outsource the job to other states — which simply makes the situation worse. The Morrison Government is intervening because that’s what any responsible Federal government would do. We’re now sending a clear signal that we need more reliable, 24/7 generation, to keep the lights on and drive down prices. We’re directly addressing the lack of incentive to keep the lights on and keep prices down when demand is strongest. Two initiatives are central to the Federal Government’s agenda. At the end of last year, we passed the Retailer Reliability Obligation through a recalcitrant COAG. Historically, the big energy retailers have not been accountable for keeping up supply of electricity to keep the lights on. That will now change. They will have a direct obligation to ensure there is enough power available to meet their customers’ needs. In parallel, the government has taken the decision to underwrite new generation into the system. This was a recommendation from the ACCC, with a particular focus on attracting new competitors and driving down prices. It also has the benefit of providing additional, reliable, 24/7 supply. Just last week we closed the first round of proposals for this program. We have received 66 submissions, often containing multiple projects in development; and while not all of these are shovel ready, many are well advanced. They extend across all of the National Electricity Market, with a balanced mix of fuel sources including coal, gas and hydro. Early analysis indicates that the strongest interest was in gas, with projects and sites identified in Queensland, Victoria, New South Wales and South Australia. Pumped hydro sites were identified across the National Electricity Market and a range of coal projects have been proposed in our largest states. The simple aim of this program is to address past failures by encouraging a more balanced and competitive power generation sector. While renewables will play an increasing role as costs continue to come down, the more traditional sources of power like coal and gas must play a role for many years if we are to protect the reliability and affordability of the system. If we examine the events of January 24, it was gas, coal and pumped hydro that provided Victorians the vast majority of their energy, whereas solar exited just as demand was at its peak and wind was unable to increase its output to compensate. In combination, these Federal Government initiatives send a very strong message to the market that we need reliable, affordable power generation. We will always encourage a commercially driven shift to renewables — but it can no longer be at the expense of affordability and reliability. Federal Labor’s 45% emission reduction target (and 50% renewable energy target) will only exacerbate this situation. Federal Labor plans to take the disastrous South Australian and Victorian experiments national. The Business Council has told us this is an ‘economy wrecking’ target. It is now crucial that informed voices in business, the energy sector and elsewhere acknowledge how reckless this target truly is. The Coalition is shifting the focus of our electricity sector back to reliability and affordability — characteristics of a sector which supported a strong energy intensive manufacturing sector and manageable household bills for decades. Our underwriting program for 24/7 reliable generation, including gas, coal and hydro, will ensure that all Australians will have access to the reliable affordable electricity they deserve. Why not just remove all subsidies ASAP? Get them started real quick. I would sign up for 10 years to a power company that builds a new coal power station.